I’m fearful to lose you. I’m fearful I’ll fail you. I’m fearful that my god is just cruel enough to take you. I’m fearful that I’m just dumb enough to lose you. Joe Gardner is an Army Airborne Veteran and a 2nd Generation American drifter and writer who calls East Lakewood, Ca home. More nights than not he can be found at home, enjoying the comfort of his family and his dog. Joe is the Founder and hired gun for Working Class Production, as well as creator and co-producer of The Last Sunday, An Evening of Poetry and Art. 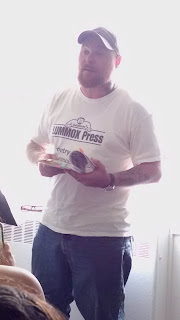 He is also the 2013 Joe Hill Labor Poetry Award recipient and his work has appeared in The Modern Drunkard Magazine, The San Gabriele Valley Poetry Quarterly, Cadence Collective, Spilt Ink Poetry and AMASS Magazine. He has also been published in the following anthologies: Gutters & Alleyways: Perspectives on Poverty and Struggle, The Men’s Heartache Anthology,Lummox Anthologies, 1 thru 3, Edgar Allan Poet 3.